5,200 exhibitors. Over 190,000 visitors. More than 1,500 lectures. 1 U.S. President. 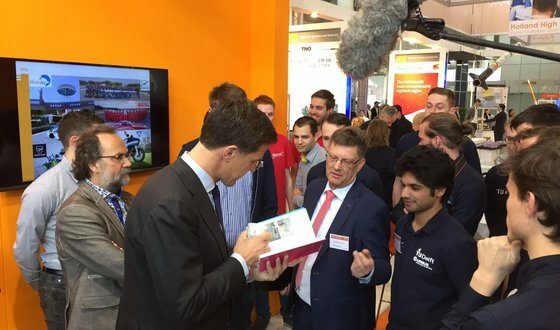 RoboValley sent out a delegation to Hannover Messe, 25-29 April. Early Monday morning, 25 April, while another hall was buzzing with U.S. President Obama’s presence, Dutch Prime Minister Mark Rutte joined the Holland High Tech stand to enjoy a cup of coffee. While there, TU Delft professor Chris Verhoeven presented the book “Robotics for Future Presidents” to our Prime Minister. Professor Verhoeven made a personal adjustment to the book presented to the PM by crossing out the “Future” of the title. Minister of Education Jet Bussemaker also received a copy of the book. After hearing what Chris Verhoeven did to the PMs copy, she jokingly said that she would circle the word “Future”.